If you're using morning tubs with your kindergarteners, then you're probably getting ready to change out your activities at the end of the month. 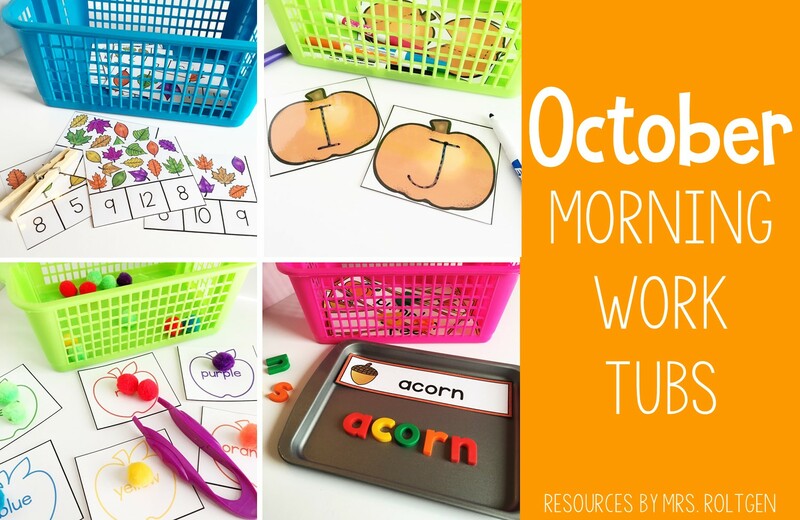 I wanted to share the activities in my October Morning Work Tubs pack today! 1. Leaf Counting Clip-It Cards: Students will count the leaves and clip the correct number. These are made self-checking when you place a small dot sticker on the back to indicate the correct number. 2. Fall Vocabulary Word Building: I use these mini magnetic cookie sheets because they fit into tubs better. These are the magnetic letters that I have. 3. Pumpkin Uppercase Letter Tracing: Laminate these cards and have students trace with dry-erase markers. There's a black-and-white version too so you could print on orange cardstock to save ink! 4. Apple Match Linking Cards: Add a fine motor component to this letter-matching activity by having students link the two matching cards with these plastic links. 5. Color Matching Clip-It Cards: Something about vertical clip-it cards is just more fun! You can use regular-sized clothespins or mini clothespins. 6. Building Numbers: I love using bendable wax sticks (like these) because they stick to laminated paper so well! I recommend cutting them into various lengths. 7. Domino Count and Match: I have always loved activities using dominoes and I've found that kindergarteners really enjoy using them, too. This is a simple counting and sorting activity that shows them different combinations to each number, too! 8. Find-It Pictures: These are simple but fun hidden picture mats with a variety of themes. 9. Sort by Color: Add more fine motor fun to this color sort activity by letting students use jumbo plastic tweezers or scooper tongs! 10. Cube Pictures: Students will use plastic cubes to make each fall and Halloween picture. 11. Shape Tracing Cards: You can laminate these and have students trace with a dry-erase marker. Or, you could have students build the shapes with dry beans or small pasta! 12. Number Order Puzzles: I suggest placing the pieces for each puzzle into sandwich-sized zipper baggies to keep the puzzles separate. 13. Food Group Sorting Cards: Students will sort each food based on whether it's a fruit or vegetable. 14. Acorn Count and Match Puzzles: These are great for one-to-one counting to 12. You could even add real acorns and students could put acorns on the acorn pictures to more strongly reinforce counting! 15. Picture Tracing Cards: These are Halloween-themed pictures that provide fun line-tracing practice! 16. Pumpkin Patch Playdough Mat: Students will roll balls of playdough to make pumpkins to show each number. 17. Fall-Themed Letter Playdough Mats: Students will build each number using playdough. You could also have students build the numbers with mini erasers or another small manipulative. 18. Line Tracing Cards: Students will trace on the line from left to right. 19. Sequencing Puzzles: There are four sequencing puzzles, and I recommend keeping the pieces for each puzzle together in quart-sized baggies. 20. Color-by-Number Mats: These are fall-themed and are a simple introduction to the concept of coloring by number. If you have any questions about the tub activities, please leave me a comment below! You can grab the October tubs or the year-long bundle by clicking on the photos below. Have a great week!